Oijanen system, Lonetrek region. On the 5th of November at 12:18 EVE Standard Time, forces belonging to the Drone Regions Federation (DRF) clashes with Project.Mayhem. [16-13] in the system. The battle was fought over 2 DRF towers in the system, previously reinforced by Project.Mayhem.. With the towers set to exit their invulnerability period at a short interval from one another on midday, both sides prepared for a battle. Project.Mayhem. formed a 110 pilot Machariel battleship fleet with 2 squadrons of dreadnoughts and several Apostle force auxiliaries in reserve. The fleet made its way to the system and set up on the first tower which was not defended. With the aid of several dreadnoughts, the tower was quickly razed and the force prepared to move to the next one. Once on the second tower, the Machariel fleet prepared to repeat the process when the local count spiked. Jumping in from the neighboring BWF-ZZ system in Geminate was a DRF Proteus strategic cruiser fleet, estimated at 130 pilots. The fleet arrived in order to contest Project.Mayhem.’s operations. Without delay, the fleet probed down and warped on top of the Project.Mayhem. fleet, and opened fire. Project.Mayhem. did not hesitate and fired back, starting the fight. The battle proved to be a close range affair. The strategic cruisers landed on top of the Machariels, and after a few probing shots focused their attention on the logistics wing of the battleships. Project.Mayhem. for its part chose to burn away from the strategic cruisers, settling on a roughly 20 kilometer distance from their assailants. The two fleets exchanged heavy fire as both fleets focused on each others’ logistics wing. Guardian and Oneiros logistics cruisers were torn apart in a hail of auto cannon rounds as the Machariels focused their fire on the relatively fragile ships. The strategic cruisers retaliated, tearing apart Guardians with salvoas of super heated plasma and concentrated beams of light which simply eviscerated their hulls. This bloody exchange continued without pause as the two sides sought to annihilate the others’ logistics wing. As the number of logistics cruisers dropped off significantly for both sides, turrets quickly locked on mainline ships. Laser fire start to cut through the thick armor plates of the Machariels, penetrating the structure beneath it and wrecking internal systems, aided by a continuous stream of super heated plasma which bombarded the hulls of the battleships. In answer, a hail of auto cannon rounds was poured on the strategic cruisers, burrowing through their armor and detonating with force inside their structure. As the Project.Mayhem. fleet commanders saw their logistics wing crumble, they gave the order to light a cynosural beacon in the midst of the war zone. Into the system materialized 3 Apostle force auxiliaries. The capital ships quickly set to work, entering their triage cycles and activating their capital remote armor repairers. With the Apostles on the field, the Project.Mayhem. 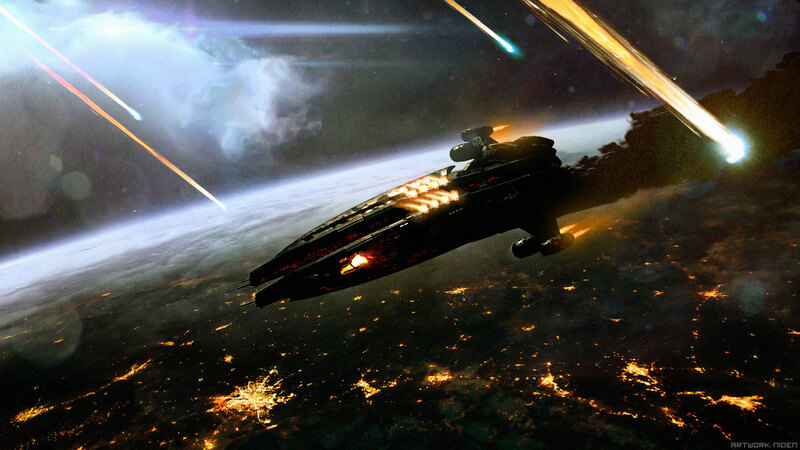 fleet quickly stabilized, managing to easily soak the incoming damage. This in turn, spelled doom for the DRF fleet, as the Machariels continued to tear apart its mainline ships. Strategic cruiser after strategic cruiser was annihilated in a vicious hail of explosive rounds as the Machariels pressed their advantage. More logistics cruisers fell prey to the ravenous battleships, weakening the already ineffective logistics wing of the DRF even further. In a few minutes, the battle turned from an equal, brutal trade to a one sided massacre. Realizing that staying would be suicide, the DRF fleet commanders ordered a retreat and hastily warped off back to BWF-ZZ, exiting the system and seemingly conceding the field to Project.Mayhem..
As Project.Mayhem. took stock of its losses and turned its attention once more to the vulnerable tower, the DRF re-shipped and prepared to engage their enemy in another round. This time, it assembled a Machariel fleet of its own. The re-organized force made its way again to Oijanen, jumping in and warping to the tower grid. Upon landing, the fleet tried to position itself on the grid, with Project.Mayhem. doing the same. Finally, the two sides met again near the tower’s shields for a second round. This time, things went quite differently for the two combatants. While Project.Mayhem.’s Machariels were fitted with afterburners and auto cannons, thus making them vicious in close range battle, the DRF chose to field their Machariels with artillery cannons and micro warp drives. This meant the DRF had the edge when it came to keeping distance and ability to volley ships, which would come into play as the battle unfolded. Right from the start, the DRF burnt away from the hostile Machariels, keeping a medium to long range for most of the fight. The Project.Mayhem. fleet attempted to pursue, but chained by the range of their Apostles and being far slower than the micro warp drive equipped battleships, it was forced to try and snipe those ships that erred too far from their anchor or were just at the edge of their optimal range. The DRF in contrast started zeroing in on its hostile brethren. Coordinated artillery barrages started making their way across the void, crashing against the Machariel hulls. The first few fire attempts were lackluster, as the DRF fleet was still uncoordinated in its firing barrages. From time to time though, the focused volley was enough to overwhelm the battleships, detonating against their armor in an unrelenting storm of fire that simply ate up the ships’ hulls, leaving but twisted wrecks in its wake. However, more often than not, the battleships would catch remote repairs, their armor plates restored by the diligent work of the Apostles. Realizing the Apostles were going to continue and be an obstacle in the fight, the DRF commanders switched their targets to the lumbering ships. A continued bombardment commenced, focused on one of the Apostles. Slowly but steadily, the Apostle was stripped of its thick armor plating as shell after shell detonated against its hull. Within moments, the smooth skin of the force auxiliary was transformed to that of a meteorite ravaged moonscape, as the artillery shells continued to dig deeper and deeper into its armor. At the same time, a cynosural beacon was lit near the Apostles and allowed a DRF dreadnought squadron to enter the fray. The dreadnoughts wasted no time in entering their siege cycles and adding their considerable firepower to the mix. Capital munitions were hurled at the besieged Apostle, breaking through its remaining armor and exposing its fragile structure to enemy fire. Yet, as the Apostle seemed ready to fall, it managed to exit its triage cycle and received remote repairs from its brothers. Whats more, Project.Mayhem. retaliated. With a target this close to them, the Machariels had no problem applying damage to the immobile dreadnoughts. Not content with merely chewing through the mix of dreadnoughts with their sub capitals alone, Project.Mayhem. answered with its own cynosural beacon, ushering in its 2 dreadnought squadrons. The Project.Mayhem. dreadnoughts materialized near their DRF counterparts. Just like them, they entered their siege cycles, targeting their brethren. With the aid of the battleships, the battle became a capital brawl, as dreadnoughts traded blows. The DRF dreadnoughts had focused their attention on the enemy Apostles, and were too slow in reacting to the new arrivals. Not only that, but with the aid of the sub capital fleet and a clear numerical advantage, the Project.Mayhem. dreadnoughts had the upper hand. One by one, the DRF dreadnoughts were felled, capital munitions battering through shields and armor as explosive rounds chewed through structure. Taking advantage of the melee, the DRF Machariel fleet changed positions on the grid, warping to a medium distance of the Project.Mayhem. Machariel fleet. With the Apostles stressed out by the immense pressure put on them by the hostile dreadnoughts, the DRF Machariel fleet took advantage and focused once again on hostile battleships. Volley after volley found their marks, and battleships simply evaporated in a storm of fire. Project.Mayhem. tried to retaliate, but was once again unable to keep up with the faster DRF battleships who stayed well out of their auto cannon range. Forced to suffer the harassing fire without the ability to respond, the Project.Mayhem. Machariels focused on dispatching the last DRF dreadnought from the field instead. With the DRF capital squadron in ruins, the Project.Mayhem. fleet decided to evacuate its own dreadnoughts off the field. An exit cynosural beacon was lit in a safe system and one by one the dreadnoughts jumped out of the field. All the while, the Machariel fleet guarding their extraction. The DRF once again used the situation to its advantage and continued to volley battleships at an increasing rate, especially as the Apostles were unable to enter their triage cycles again as they waited their turn to extract. Volley after volley saw Project.Mayhem. battleships disappear in a flash of light, leaving behind nothing but clouds of debris. Finally, only 1 Apostle remained on field, but it was quickly tackled by DRF forces, forcing both it and the fleet guarding it to stay put. The Project.Mayhem. support was able to free the tackled ship and it jumped out as well, leaving its sub capital fleet behind. For the Machariel fleet, suffering continued losses at the hands of the DRF and with its capital force secure, it was time to leave. Without delay, the Project.Mayhem. fleet warped out, conceding the field to the DRF. For the DRF, having managed to secure 1 of the 2 towers and win the field, it was time to extract. After looting the field, the DRF fleet returned again to its staging system next door, bringing the fight to an end. All told the battle on its 2 parts lasted 1 hour with the system hosting 253 pilots at the peak of the fighting and no Time Dilation reported. Project.Mayhem. lost 39 ships in the battle, including 23 battleships for a total of 31.16 billion ISK damage. Drone Regions Federation lost 65 ships in total, including 6 dreadnoughts, 1 force auxiliary, 2 battleships and 22 strategic cruisers for a sum of 41.46 billion ISK damage. Hey! Quick question that’s totally off topic. Do you know how to make your site mobile friendly? My blog looks weird when browsing from my iphone 4. I’m trying to find a template or plugin that might be able to correct this problem. If you have any recommendations, please share. Many thanks! I just want to say I am new to blogging and seriously enjoyed this blog site. More than likely I’m want to bookmark your blog . You actually come with exceptional articles. Appreciate it for revealing your web page. Are there any type of good poetry sites that you know of so that I can have an account that has great deals of area to kind out stories/poems on? Or do you recognize of any kind of writing sites in any way that I could post blog sites on, sort of like having an entire internet site to myself?. What is the very best software program to create sites and also blogs?